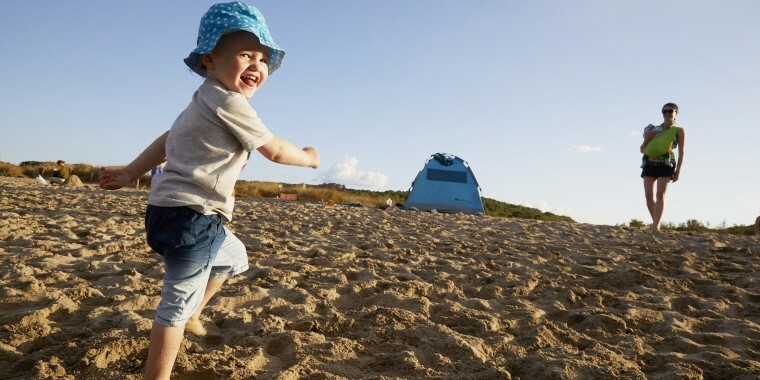 Toting a toddler to the beach means bringing a bunch of toys for the sand, a cooler full of snacks, extra changes of clothes and — don’t forget — a good child-friendly sunscreen. Even though applying sunblock to a toddler can feel as hard as wrestling an oiled pig, you need to do it. “Sunburns at an early age are associated with an increased risk of melanoma,” said Dr. Kalyani Marathe, a pediatric dermatologist at Children’s National Health System in Washington, D.C. Since UV rays can damage or burn skin in as little as 15 minutes, it's wise to take preventative measures. Of course, you want your toddler to have fun. So, there's no need to avoid going out in the sun completely. Just follow a few sun-safe tips. 1. Find the right sunscreen. For enough protection, Marathe recommends looking for an SPF of at least 30. Then, turn over the bottle and read the ingredients. According to Marathe, a good formula contains at least 10 to 15 percent zinc oxide or more than 5 percent titanium dioxide. As active ingredients, zinc and titanium physically block broad-spectrum UVA and UVB rays. Plus, mineral-based sunscreens tend to be gentler on young skin, decreasing the risk of irritation. Lotions and creams are best for providing coverage on larger body parts, like the chest and back. 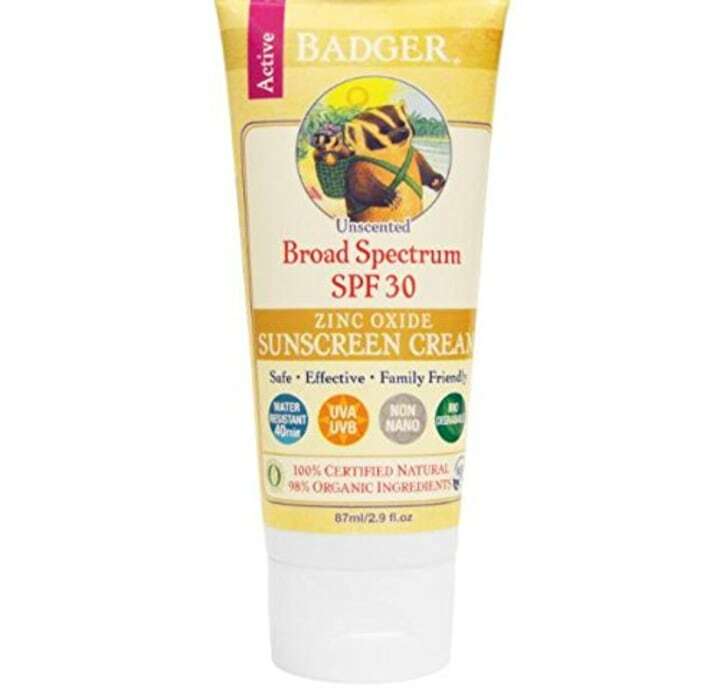 And, Badger is a trusted brand — the kids lotion made the Environmental Working Group's list of the best sunscreens for kids. This organic sunscreen contains the recommended amount of zinc oxide. If you avoided buying zinc oxide or titanium dioxide SPFs in the past because they added a white or ashen hue to skin, you’ll probably be happier with them today. “Newer formulations are much finer, user-friendly, and less cakey,” said Marathe. The Aveeno Baby sensitive skin lotion also fits the bill. The Aveeno lotion also made the list of best sunscreens according to EWG. It uses zinc oxide to physically block broad-spectrum UVA and UVB rays. Plus, the special baby formula is meant to reduce tears. Marathe also noted that aerosol sunscreen sprays may be convenient, but they’re known for missing spots. Plus, kids can also inhale the particles from the aerosol, so it’s best to avoid these. 2. Consider sunscreens for sensitive skin. 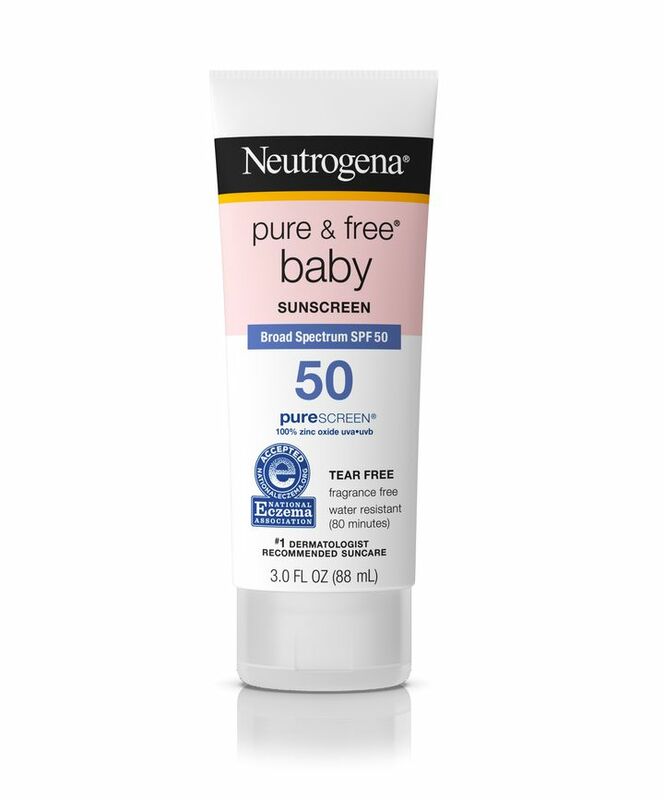 For especially sensitive skin, look for a fragrance-free formula, like Neutrogena Pure & Free Baby or California Baby Super Sensitive mineral sunscreen. If you’re especially nervous about a potential reaction, you can apply a new sunscreen to the inner part of your child's arm twice a day for a week. Redness, itchiness and blistering are signs that they’re allergic to something in the formula. However, Marathe noted that an actual sunscreen allergy is rare. 3. Check out the sunscreens designed for faces. For faces, ears and the back of the neck — areas often missed on toddlers — use a stick formula, like the Coola mineral baby unscented sunscreen stick. The waxier texture of a stick formula is less likely to run into kids' eyes and sting. 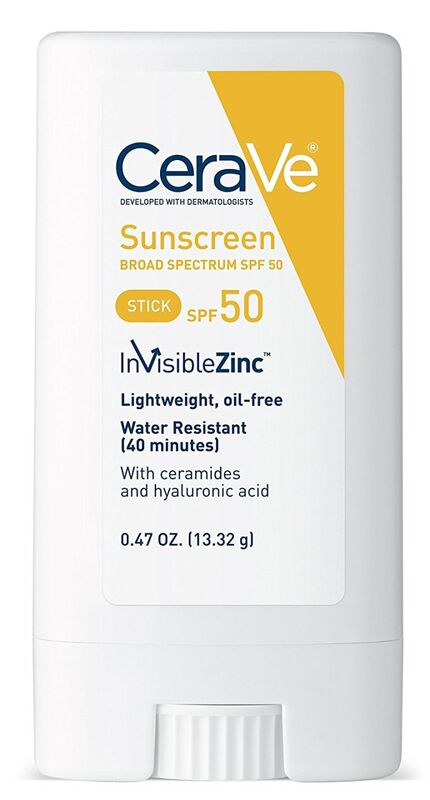 You can also try the CeraVe SPF 50 sunscreen stick. Its fragrance-free, zinc oxide formula is long-lasting and easy to apply. 4. Remember to apply sunscreen often. Sunscreen doesn’t last forever, and so many parents forget to reapply or avoid it altogether. Who can blame them? Wrangling toddlers out of the pool can be tough. But, you’ll need to reapply SPF at least every two hours — or every hour if they’re sweating a lot or swimming. Considering that 70 percent of UV radiation sneaks through clouds, you’ll still have to keep up with this schedule even on an overcast day. “Most people learn that the hard way after getting burned,” said Marathe. If it’s an ongoing battle to get sunscreen on your tot, you’re going to avoid it. “The best sunscreen is one that you’ll actually use,” noted Marathe, who added that finding the one that works for your family involves trial and error. “There is one out there for your kids. Just keep trying." 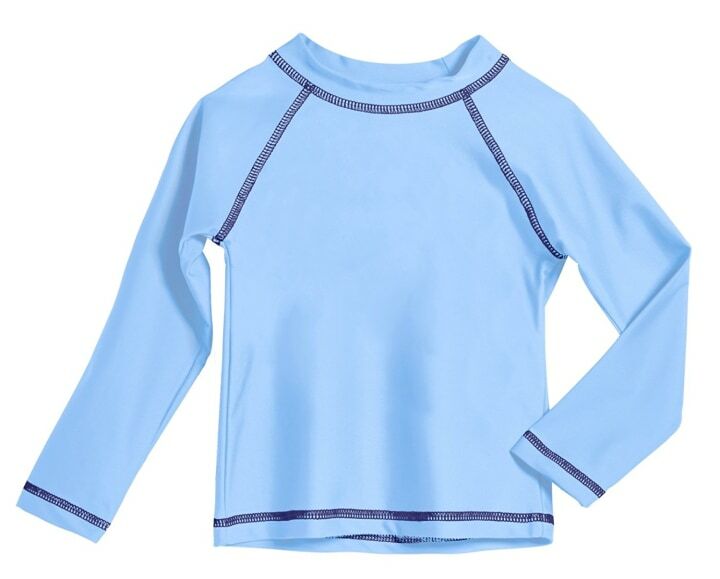 If you’ll be heading to the beach, pool or splash pad a lot this summer, consider buying a long-sleeve rash guard. It is often an easier way to protect toddlers' skin from the sun. But, continue to put SPF on uncovered areas. Try the City Threads rash guard ($10-$25, Amazon). It quickly dries after swimming and provides SPF 50 protection. Also, have toddlers wear hats (if they’ll keep them on their heads … ) and sunglasses, too. But, if you know your toddler won’t have any of that, at least pitch a sun protective umbrella or tent at the beach or pool to provide some shade in between dips. The Sport-Brella sun umbrella is one of the best-sellers on Amazon. 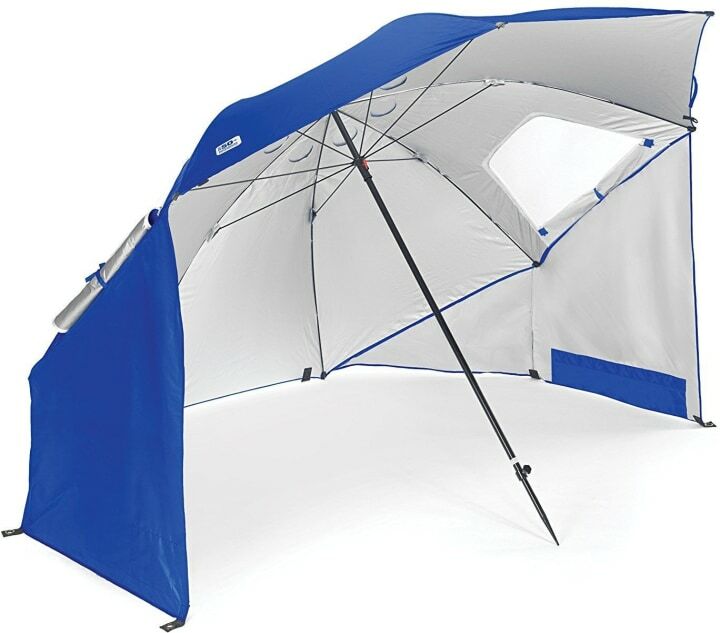 The umbrella provides up to SPF 50 sun protection, and the side windows add extra coverage. Now you’re all set for some fun in the sun this summer. Just don’t forget the applesauce pouches and fruit snacks, or you’re going to hear it.